Just How Many Stations of the Cross Are There? Did you know that not everyone marks the stations of the cross in quite the same way? Here at St. Luke’s we traditionally have eight stations. Some churches follow fourteen stations of the cross. A few readers have asked about the different Stations of the Cross. 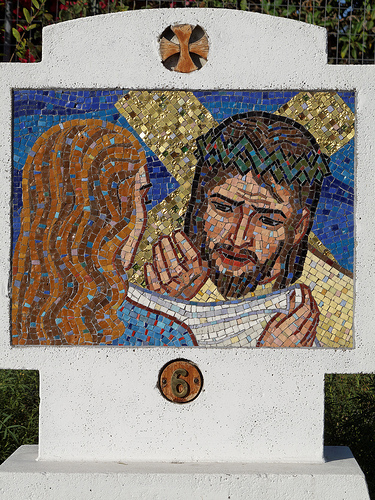 For example, here at St. Luke’s the Sixth Station is “Jesus is nailed to the Cross,” while other churches mark “Veronica Wipes the Face of Jesus” as number six. We’ve been referring to this page from The Passionist Missionaries and thought you might like to take a look too. If you have other links that speak to differing names and numbers for stations, please let us know in the comments. § 3 Responses to Just How Many Stations of the Cross Are There? This is a fascinating topic to me! I have one “Way of the Cross” that begins with Station 1, “Jesus Prays in the Garden of Olives,” or that includes “Jesus is Betrayed by Peter.” What do we include, what do we leave out? Which station draws us more deeply to the story? There is a lesson for children called “The Faces of Easter” (from the Godly Play curriculum) which reminds me of the stations: 7 images of Jesus’ life including the newborn child, the boy lost and found, the man who was baptized, the tempted teacher, the healer, the face set toward Jerusalem, and the face of the cross/the face of easter (an inseparable image). It has a similar power to draw us into the mystery of Jesus’ life and death. I am very interested in this subject too. “Jesus Prays in the Garden of Olives” feels rich to me, a fruitful and meditative place to start the journey of the stations. When I was writing my reflection on ‘our’ first station, Jesus is condemned to death, I struggled with seeing that as the starting point. I am a new rector, and thus am experienceing Lent in a new setting. We have several sets of stations, I am told (but I have only found one set–quite dusty and not terribly compelling in my opinion). And I have found prepared booklets of the Way of the Cross–so I know that the experience of the stations has happened here before. I have scheduled a corporate service of the Way of the Cross for the Tuesday in Holy Week–it will be interesting to see what develops. But meanwhile, I am intrigued in Mother Mary’s comment. Our chapel is called the Bethlehem Chapel–it used to be specifically a children’s chapel, with chile-sized appointments. We now use it for mid-week services. The stained glass windows depict scenes from the life of Jesus that have to do with either His childhood or other children. They make a “way” to follow as well. I am enjoying this blog! You are currently reading Just How Many Stations of the Cross Are There? at Blog of St. Luke in the Fields.